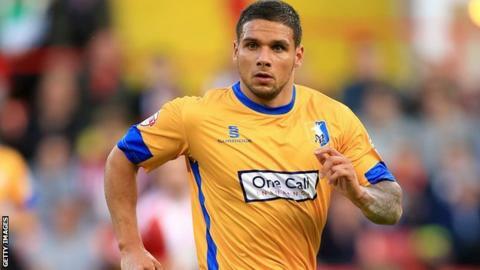 A Liam Hearn hat-trick helped Lincoln recover from going two goals down inside the first seven minutes to beat Macclesfield in an eight-goal classic. Headers from Kristian Dennis and Paul Lewis made it 2-0 to the Silkmen before Hearn grabbed his first with a header and then rifled home for 2-2. Matt Rhead's header put the hosts in front after 26 minutes and he hammered home his second after the break. Hearn got his treble with a good finish and Dennis scored in the last minute. "This is what we looked for in our close-season recruitment - characters that would not lay down, but keep going and get back into the game. They've done that brilliantly tonight. "You get a goal back and you're back in the game. We kept going, kept doing the right things and ended up winning. "Liam's coming back to full fitness now, he gets half a yard and he's in and he scores goals. He's so sharp and his movement in the box is very difficult to track." Match ends, Lincoln City 5, Macclesfield Town 3. Second Half ends, Lincoln City 5, Macclesfield Town 3. Attempt missed. Chris Bush (Lincoln City) left footed shot from outside the box misses to the left. Goal! Lincoln City 5, Macclesfield Town 3. Kristian Dennis (Macclesfield Town) left footed shot to the bottom right corner. Assisted by Dan Cowan. Attempt blocked. Danny Whitehead (Macclesfield Town) left footed shot from outside the box is blocked. Attempt missed. Danny Whitehead (Macclesfield Town) right footed shot from outside the box misses to the right. Attempt missed. Lee Beevers (Lincoln City) left footed shot from outside the box. Attempt missed. Matt Sparrow (Lincoln City) right footed shot from outside the box misses to the right. Attempt missed. Danny M. Rowe (Macclesfield Town) left footed shot from outside the box misses to the right. Substitution, Lincoln City. Greg Tempest replaces Jack Muldoon. Substitution, Lincoln City. Alan Power replaces Jon Nolan. Substitution, Macclesfield Town. Danny Whitehead replaces Paul Turnbull. Goal! Lincoln City 5, Macclesfield Town 2. Liam Hearn (Lincoln City) right footed shot from the right side of the box to the bottom left corner. Substitution, Macclesfield Town. Ritchie Branagan replaces Shwan Jalal because of an injury. Attempt missed. Kristian Dennis (Macclesfield Town) left footed shot from outside the box misses to the left. Substitution, Macclesfield Town. Danny M. Rowe replaces Chris Holroyd. Hand ball by Jack Muldoon (Lincoln City). Attempt saved. Callum Howe (Lincoln City) left footed shot from the right side of the box is saved. Goal! Lincoln City 4, Macclesfield Town 2. Matt Rhead (Lincoln City) right footed shot from outside the box to the top right corner. Assisted by Lee Beevers with a cross. Second Half begins Lincoln City 3, Macclesfield Town 2. First Half ends, Lincoln City 3, Macclesfield Town 2.